Fantasy Flight Games has been well-known for being closed-mouthed about a project until the last minute to surprise fans. Now, it seems like they’re intentionally saying one thing, but doing the opposite. Fortunately, FFG’s latest stunt isn’t “I totally didn’t put a rattlesnake in your bed” only to be greeted by the horror of feeling a scaly bedmate when you slip under the covers, but rather “honey, I didn’t do anything for our anniversary” but surprises her with a week-long cruise anyways. If the following announcement is an example of the kind of “lying” that FFG is going to be doing, well, Fleetwood Mack sang it best, I suppose. 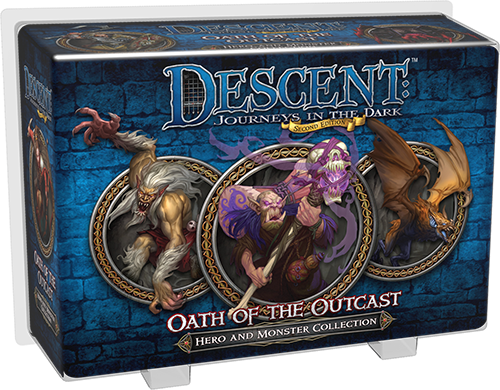 Latest news out of FFG for Descent, 2nd Edition is Oath of the Outcast, a hero and monster expansion. What heroes and monsters? Well, the monster lineup is the Razorwing, Beastmen, and Bane Spiders…our heroes include Shiver, Laurel of Bloodwood, Elder Mok, and Trenloe the Strong. Why, Hello thar, familiar faces!